The history of Metalloglobus traces back almost over a century – it was founded in 1923 by Manfred Weiss in order to ensure the metal supply to his own company. After 1945 the company was nationalized and, at the time, was one of the country’s biggest commercial companies. The foundry, which is the predecessor to Fémöntő Ltd, was founded in 1968 and has been producing soft solder since the 1970’s. After the regime change, the company was privatized and organized into business units. 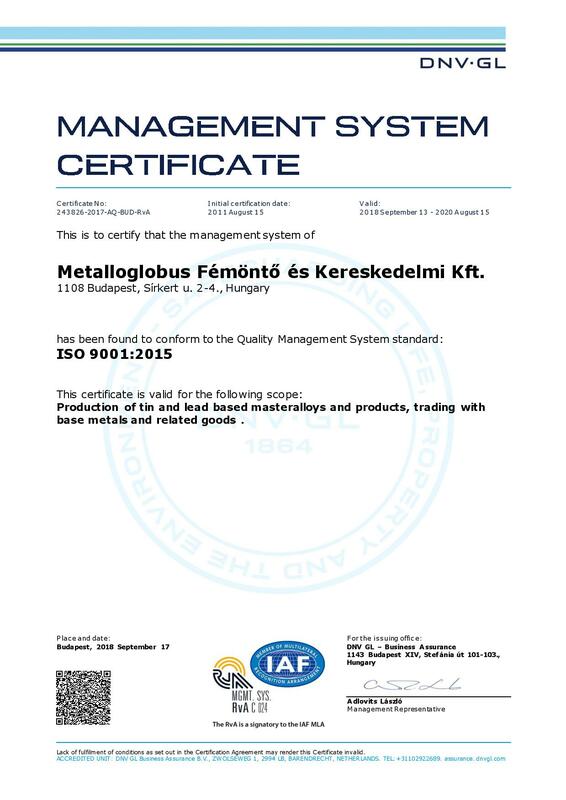 Metalloglobus Fémöntő Ltd was the sole manufacturing unit which produced and sold lead-tin alloys. In 2004 Mihály Vlaszák, the current owner, took over and continued the tradition of the company. Our company has a strong market postion, extensive business network and great experience at selling and manufacturing tin and lead products. In Hungary we have a unique production capacity (casting machine, melting furnaces, drawbenches and pressing tools) and knowledge about soldering tin, lead wires and tin-lead alloy production. Additionally, due to our manufacturing capabilities, we are able to manufacture more complex lead alloys. Our quality policies ensure we are in line with our corporate process, which entails the high quality production, customer centered thinking and flexibility in services. Our goal is to not only sell and provide services at a high level to our customer, but also foster their development. In collaboration with our stakeholders we continously seek new ventures, where we could expand our business, product portfolio and improve our services. Metalloglobus applies to various innovation projects with a high success rate and seeks partnerships which could enhance sustainability and efficiency. In 1992 the company developed its quality control system in accordance with ISO 9001 standards. Since 1999 DNV (DET NORSKE VERITAS) verifies that the quality system of our company conforms with the ISO 9001:2000.